Published: June 18, 2009 at 03:45 p.m. The culture is slowly changing in Tampa, and Bucs fans are in for a major surprise in '09. A franchise that has been anchored by a hard-hitting defense over the past decade is set to sail in a new direction: behind a high-powered offense. 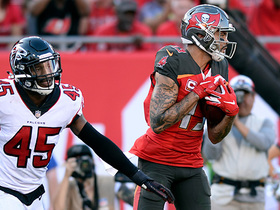 The sight of a prolific offense may be a new experience for Bucs fans accustomed to watching a pedestrian unit that only cracked the top 10 in total offense once during the Jon Gruden era. Moreover, the team averaged more than 20 points in just three of his six seasons. 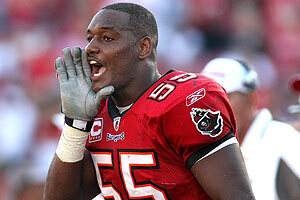 During Jon Gruden's tenure as head coach (2002-08), former LB Derrick Brooks (above) and a stout defense were relied upon to keep the team competitive. With an offense incapable of scoring points in bunches, the Bucs were forced to play a ball-control style that put the onus on their hard-hitting defense to keep the score down for the team to win games. However, that philosophy may be a thing of the past with new offensive coordinator Jeff Jagodzinski assembling a potential juggernaut. Jagodzinski, who arrives in Tampa after compiling a 20-8 record as the head coach at Boston College, is set to unveil a dynamic offense anchored by a downhill running game and a big-play aerial attack. 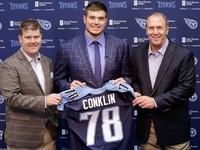 As a proponent of a zone-based scheme, Jagodzinski is intent on building a physical rushing attack that punishes defenses between the tackles. He was part of the Atlanta Falcons coaching staff that built a league-leading running game behind the scheme, and the team's athletic offensive line positions the Bucs to have similar success utilizing the system. In revamping the team's passing game, Jagodzinski will feature a vertical passing game designed to take advantage of the eight-man fronts that defenses will use to defend the Bucs' potent rushing attack. With single coverage on the outside, the team will look to take more shots down the field, which should yield bigger plays in the passing game and result in more points. While Jagodzinski's brilliant command of the X's and O's should fuel the optimism in Tampa, it's the wealth of talent at his disposal that has the Bucs primed for an offensive explosion. Offseason additions Derrick Ward and Kellen Winslow join Antonio Bryant and Earnest Graham as playmakers on an offense anchored by one of the best young offensive lines in football. The impressive collection of talent has the potential to make waves immediately under Jagodzinski's direction. Ward, who was signed to a four-year, $17 million deal during the offseason, gives the team a versatile feature back with outstanding skills. The five-year veteran rushed for 1,025 yards and averaged a whopping 5.6 yards per carry in 2008. Though he spent most of the season as a rotational player for the Giants, Ward recorded two 100-yard games and added 41 receptions for 384 yards. As a tough, hard-nosed runner with big-play ability, he gives the Bucs a between-the-tackles banger with exceptional ability. Ward's eight runs over 20 yards last season ranked as the eighth most in league, and that's indicative of the exceptional playmaking skills that he brings to the team. 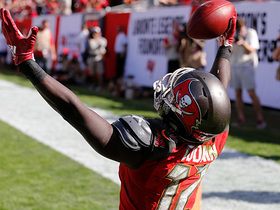 In Earnest Graham, the Bucs have another physical, downhill runner. The five-year veteran finished as the team's second-leading rusher with 563 yards in 10 games last season. Though he missed six games due to an injury, Graham showed that he was capable of carrying the load in 2007 when he led the team in rushing with 898 yards and 10 touchdowns. He has amassed five 100-yard rushing games in the past two seasons and is a viable option as the designated grinder in the offense. 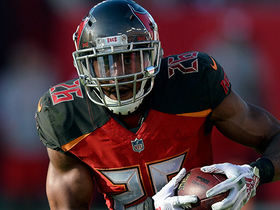 The Bucs' deep running back rotation also features a pair of wild cards that could push their rush offense to the upper echelon of the league. Carnell "Cadillac" Williams and Clifton Smith are expected to see some time as part of the rotation, and each brings a unique set of skills to the table. Williams, the team's first-round pick in 2005, has shown glimpses of being an All-Pro-caliber runner in the past. The four-year veteran rushed for over 1,000 yards as a rookie and has eight 100-yard games in his career. However, he hasn't topped the century mark in two seasons and is coming off his second straight season-ending knee injury. If Williams is able to return to health, he could give the Bucs a nice complement as a part-time runner. Smith, who earned a Pro Bowl nomination as a kick returner, gives the Bucs a potential big-play weapon in the running game. Although he lacks the size to be heavily involved as a runner, his electrifying running skills as a returner make him a dangerous option when used on gimmick plays. Smith may not factor prominently into the game plan, but he could have a significant impact by season's end. 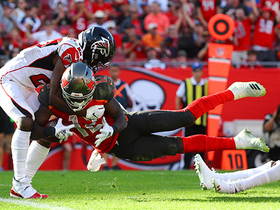 While the Bucs' running game appears to be in good hands with the diverse group of runners, the Bucs' aerial attack shows explosive potential as well. Led by Antonio Bryant and Kellen Winslow, the Bucs have a talented cast of playmakers in the passing game. Bryant, who led the team in receptions (83) and receiving yards (1,248) in 2008, is undoubtedly the team's top option in the passing game after tallying six 100-yard games in 15 starts. The seven-year veteran is a precise route-runner with outstanding hands. In addition, he is a rare No. 1 receiver with big-play ability. Bryant finished last season with four receptions over 40 yards, and he sports a robust 15.3 yards per catch average throughout his career. In an offense designed to feature more vertical throws, he could put up big numbers in 2009. Winslow, who was acquired in a trade with the Browns during the offseason, gives the Bucs a much-needed threat in the middle of the field. The former Pro Bowler has unique athleticism for the position and poses a matchup problem for defenses. Winslow exploited those matchups on the way to a 1,000-yard season two years ago, and he led all tight ends in receptions (89) in 2006. With Jagodzinski planning to incorporate a bevy of two-tight end sets with Winslow lined up opposite Jerramy Stevens, the five-year veteran could punish defenses attempting to cover him with a linebacker and provide the kind of impact at the position that hasn't been seen in Tampa since the days of Jimmie Giles. With an endless supply of explosive weapons available at the skill positions, the Bucs' quarterback situation may not be as dire as it appears to some outsiders. 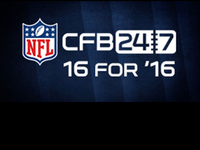 The team only needs an efficient game manager capable of making sound decisions as a distributor in the passing game. While play-making ability is an added asset, the Bucs' starting quarterback only needs to effectively move the ball down the field by making a handful of plays each game. In looking at the three candidates -- Byron Leftwich, Luke McCown and Josh Freeman -- vying for the position, each brings a unique set of skills that would allow them to function successfully as the Bucs' triggerman. Leftwich, a six-year veteran with 46 career starts, gives the team an experienced leader in the pocket. Blessed with a strong arm and a deft touch, he is ideally suited to play in a vertical passing game that features a host of deep throws. Although he has been derided for his slow windup and lack of mobility in the pocket, Leftwich is poised for success in the Bucs offense due to the team's strong offense line and potent rushing attack. He enjoyed his best season as a pro in 2005 with a Jaguars' offense that featured the league's 10th-best rushing attack. With the running game serving as the focal point, Leftwich acted as an effective complement by completing 57.9 percent of his passes with 15 touchdowns and only five interceptions on his way to an 89.3 passer rating in 11 starts. Thus, it's easy to envision Leftwich experiencing similar success in Tampa's rebuilt offense. In McCown, the Bucs have an athletic quarterback with intriguing physical tools but little experience as a starter. Although he is entering his sixth season in the league, he has only logged seven starts during his career and has a 1-6 career record in those contests. But McCown shouldn't be judged harshly on his record because he has played well for the Bucs when he has received the starting nod. In 2007, he completed 67.6 percent of his passes while tallying five touchdowns and three interceptions for a 91.7 passer rating in five games, including three starts. With McCown under center, Jagodzinski would likely incorporate more movement passes to take advantage of his superior athleticism. This would not only add a dimension to the Bucs' passing game, but it would give the team an effective counter package to complement its zone-based running scheme. Josh Freeman, the team's first-round pick, is the x-factor in the competition. The former Kansas State star brings outstanding athleticism and potential to the position. 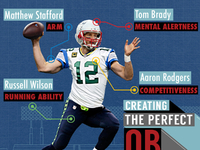 The big, strong-armed thrower has the ability to make every throw in the offense. In addition, he has the elusiveness to avoid the rush in the pocket. 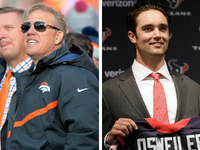 However, he enters the league with only three years of collegiate experience, and history has repeatedly shown that early entrant quarterbacks typically struggle during the first few seasons of their career. Thus, it appears unlikely that the rookie star would be able to wrestle the job from one of the veterans prior to the season. In any case, the Bucs offense has the talent and versatility to roll regardless of the team's starting quarterback in 2009. After years of relying on their stellar defense to lead the way, the Bucs are set to use a potent offense to navigate their way back into title contention in 2009.